Spanish Prime Minister Mariano Rajoy Brey asked African leaders, including Equatorial Guinea’s President Obiang Nguema Mbasogo, to consider his country a partner for growth at the assembly of the 23rd African Union Summit, held in Malabo. In a speech at the opening session of the Assembly of Heads of State of the African Union Summit (AUS), Rajoy told the African leaders that he was in Equatorial Guinea to ask for more trade and investment with African countries. “I am not here to offer anything because I do not have anything that Africans cannot give themselves. I come here to ask that you count Spain as a partner for your growth. I come to ask for more trade and more investment between our countries, and I come to reiterate that Spain wants to participate in the rebirth of Africa,” said Rajoy. Rajoy said that Africa’s growth offered Europe a path of recovery while it battled an economic crisis. Over the past decade, Spain’s trade with Africa has grown by 250 percent. “Our investment in Africa is still small, but it has not stopped growing, even during the crisis. It should be normal for Spain to have much stronger relations with this continent than what they are now. We want to invest in Africa. The more prosperous Africa is, the more prosperous Spain will be,” said Rajoy. “Peace, democracy and economic openness have allowed Africa to move forward,” Rajoy said. Rajoy’s visit marks the highest-level Spanish trip to Equatorial Guinea in 23 years. Rajoy and Obiang met Wednesday before the assembly began. In addition to Rajoy, the Secretary General of the United Nations, presidents of Egypt and the Palestinian State, and the Vice President of Cuba participated in the opening session. The 23rd African Union Summit focuses on Agriculture and Food Security. The Summit will conclude this afternoon after a week of meetings. Equatorial Guinea’s President, Obiang Nguema Mbasogo, asked African countries to invest heavily in their agricultural sector to decrease their dependence on the developed world, ensure food security, and significantly reduce hunger in their countries. He made his remarks at the closing session of the Assembly of Heads of State of the African Union (AU). President Obiang said that Africa should reorient itself to ensure its independence and security of African states through the safe production of its own consumer goods. “Africa cannot be content to continue with the current dependence on the economies of the developed world. Africa is sailing upstream against a dependency that prevents them from moving toward sustainable development. Africa should rethink its relationship with the developed world to reduce as far as possible the gap that prevents access to development,” said Obiang. “The development of agriculture can greatly reduce this dependence,” he said. “Africa can ensure food security and significantly reduce hunger in our countries. Africa should heavily invest in agricultural development to transform itself in order to accelerate growth to increase production and productivity,” said Obiang. President Obiang proposed to the African Union the establishment of a program that focuses on the organization and exploitation of markets to promote trade and food security and to eradicate hunger, malnutrition and rural poverty. This will also reinforce the fight against climate change and agriculture. He noted that Africa counts on the support of organizations focused on agriculture and ways to improve the sector, and urged continued support for those organizations. Obiang also urged his fellow Africans to prioritize South-South cooperation, a cooperation that respects the principles of equality. A session on agriculture and food security under the slogan “Transforming Africa's Agriculture, for Shared Prosperity and Improved livelihoods, through Harnessing Opportunities” was held in the afternoon. President Obiang reaffirmed the interest of his country in continuing with the guidelines established in the African Peer Review Mechanism (APRM) and developing projects to help member countries develop more modern, economies, enjoy sustainable development, and establish modern and transparent legal and regulatory structures. He made his remarks during the 21st Forum of the Heads of State and Governments at the annual African Union Summit in Malabo, Equatorial Guinea’s capital. Ellen Johnson Sirleaf, President of Liberia and President of APRM, also chaired the forum and explained the work that the organization has carried out to help bring African nations’ laws into compliance with the guidelines. The APRM was established by the African Union in the framework of the implementation of the New Partnership for Africa’s Development (NEPAD). APRM aims to foster the adoption of policies, standards and practices that lead to political stability, high economic growth, sustainable development and accelerated sub-regional and continental economic integration through experience sharing and reinforcement of successful and best practices, including identifying deficiencies and assessment of requirements for capacity building. 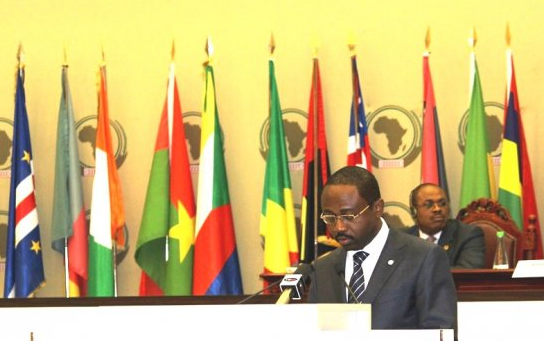 Today, President Obiang closed the session of the Assembly of Heads of State of the African Union (AU). The secretary general of the United Nations, Ban Ki-moon, Egyptian President, Abdel Fatah El-Sissi, Prime Minister of Spain, Mariano Rajoy, among others joined President Obiang during the opening ceremony. Government of Equatorial Guinea Provides Building to House UN Agencies in Country. 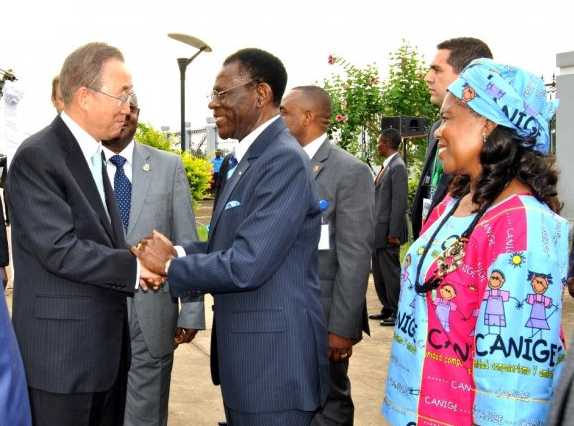 Equatorial Guinea’s President, Obiang Nguema Mbasogo, yesterday presented a new building, funded by the Government of Equatorial Guinea, to UN Secretary General Ban Ki-moon, who is visiting the county to attend the 23rd African Union Summit (AUS). President Obiang recalled that the United Nations has spent decades working hand in hand in the development of Equatorial Guinea since the country gained its independence from Spain in 1968. He said that UN agencies such as the UNDP, FAO and UNICEF have been critically important in raising the standard of living and generally improving the quality of life for citizens of the country..
Equatorial Guinea has forged a close relationship with the UN on several fronts. Most recently, the government donated thirty million dollars to the Solidarity Fund to Fight Hunger in Africa. During the UN building inauguration, the Director General of the FAO, Jose Graziano da Silva, signed agreements with the representatives of 26 African countries to implement projects with this solidarity fund. Equatorial Guinea’s minister of foreign affairs and cooperation, Agapito Mba Mokuy, led the 25th ordinary session of the Executive Council of the African Union (AU). During his welcoming speech, Minister Mba Mokuy said Equatorial Guinea is committed to defending African interests. He pointed out the theme chosen in this forum, “Agriculture and Food Security,” and made reference to the great challenges faced by the continent. “Africa has abundant areas of fertile and arable land, with the highest proportion of young population and highest levels of human growth. However, Africa cannot benefit from its potential because it suffers situations of insecurity or lack of self-governance. This is a huge challenge in the context of the commitments to our citizens, who wish to live in a continent that is self-sufficient and able to provide and meet the basic needs of its citizens,” concluded Minister Mba Mokuy. The Executive Council of the AU consists of ministers and special authorities designated by the governments of the states that make up the institution, and is the responsible body before the Assembly of Heads of State and Government. The chairperson of the AU Commission, Dlamini Zuma, joined Minister Mba Mokuy at the opening session of the Executive Council of the African Union, as did the executive secretary of the Economic Commission of United Nations for Africa, Carlos Lopes, who is also deputy secretary general of the United Nations; and the minister of foreign affairs and Cooperation of the Islamic Republic of Mauritania, Ahmed Ould Teguedi. The presidents of Equatorial Guinea, Spain, Egypt and the Palestinian State, the vice president of Cuba and the secretary general of United Nations, among others, will participate in the opening of the session of the Assembly of Heads of State of the African Union Summit (AUS) taking place in Malabo on June 26 - 27. The Year of Agriculture and Food Security will be presented by Rhoda Peace Tumusiime, Commissioner for Rural Economy and Agriculture on June 26. The study of the budget for 2015, and a series of technical analyses, including the Report of the Peace and Security Council, will take place on June 27. Other subjects to be discussed on the last day of the AUS are the Project for the Establishment of the African Monetary Fund; the Draft AU Convention for Transboundary Cooperation (Niamey Convention), and the study of the report of the president of the Republic of Liberia, Ellen Johnson Sirleaf, regarding the contributions to the African common position on the Post-2015 Development Agenda. Nkosazana Dlamini Zuma, African Union Commission Chair, inaugurated the 23rd African Union Summit (AUS) with the opening of the 28th Ordinary Session of the Permanent Representatives' Committee (COREP) held in the Conference Center of Sipopo, located in Malabo Equatorial Guinea. She urged all the delegates to support the initiatives aimed at improving agricultural production and food security, the two main themes of this meeting. The Chairperson also recalled the importance of improving the investment by African countries in education, skills, science and technology, in order to achieve development and build modern infrastructures, and pointed out that governments that have advanced the most are those that invest heavily in these areas. The 25th Ordinary Session of the Executive Council began today and will culminate tomorrow. The Heads of State of the AU will convene at the 23rd Ordinary Session of the Assembly of the African Union, which will take place on June 26-27. The Republic of Equatorial Guinea will welcome leaders from the African continent and around the world at the 23rd African Union Summit (AUS) to be held in the capital city of Malabo on June 20-27, 2014. Under the theme “Agriculture and Food Security,” the conference will serve as a frame for members seeking commitments to increase and improve agricultural production on the continent. Agriculture and food security have been part of the conversation in past high-level meetings aimed at sharing the vision, goals and commitments needed to define African agricultural growth and build a transformation agenda for the upcoming decade. These issues were discussed at the meeting in Durban, South Africa, held in March 2014, and the Special Conference of Ministers of Agriculture and Fisheries, which took place between April 28 and May 2, 2014, in Addis Ababa, Ethiopia. In previous meetings, AU member countries have discussed the Agriculture Development Program (CAADP); the increase of agricultural productivity on the continent; strategies to combat poverty and reduce food problems through agricultural transformation; the creation and strengthening of agricultural associations and other entities; the promotion of trade in agricultural products; creating employment opportunities for young people in rural areas, among others. Secretary General of the United Nations, Ban Ki-moon will attend the AUS. 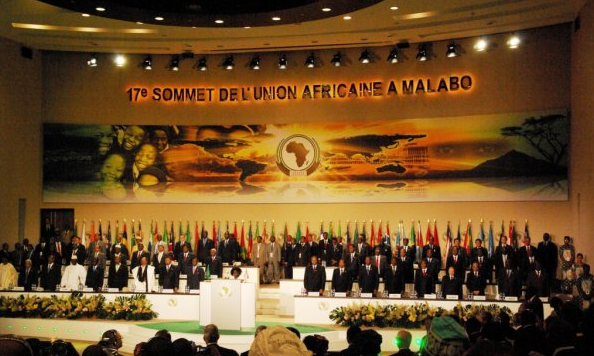 The Assembly of Heads of State of the AU will take place on June 26 and 27 in Malabo, Equatorial Guinea. Equatorial Guinea has built a modern infrastructure to support important international meetings. It hosted the 17th African Union Summit in January 2011. Equatorial Guinea’s President Obiang Nguema Mbasogo joined Secretary-General of the United Nations, Ban Ki-moon, heads of state and government, and representatives of major international organizations at the G77 + China Summit held in Santa Cruz de la Sierra, Bolivia, on June 14-15, 2014. The G-77 member countries work together to promote their collective economic interests and enhance their joint negotiating capacity on the main economic issues, as well as promote South-South cooperation for development. Under the summit’s theme “For a New World Order for Living Well,” President Obiang said South-South cooperation is a reality, and emphasized the need to strengthen this cooperation in order for developing countries to be able to support themselves through processes such as the creation of institutions to support their economic activities, among others. Both President Obiang and Evo Morales, Bolivian President, stressed the importance of developing countries working together to improve their economies and protect their natural resources and meet the challenges and pressure from northern countries, since the southern states of the world are also the ones that hold the greatest potential for natural resources. The G-77 is the largest intergovernmental organization of developing countries in the United Nations. It has 133 member countries. The organization was created on June 15, 1964, as a means for the countries of the South to articulate and promote their collective economic interests and enhance their joint negotiating capacity on all major international economic issues within the United Nations system, and promote South-South cooperation for development. New frigate will help protect shipping and combat piracy in the Gulf of Guinea. 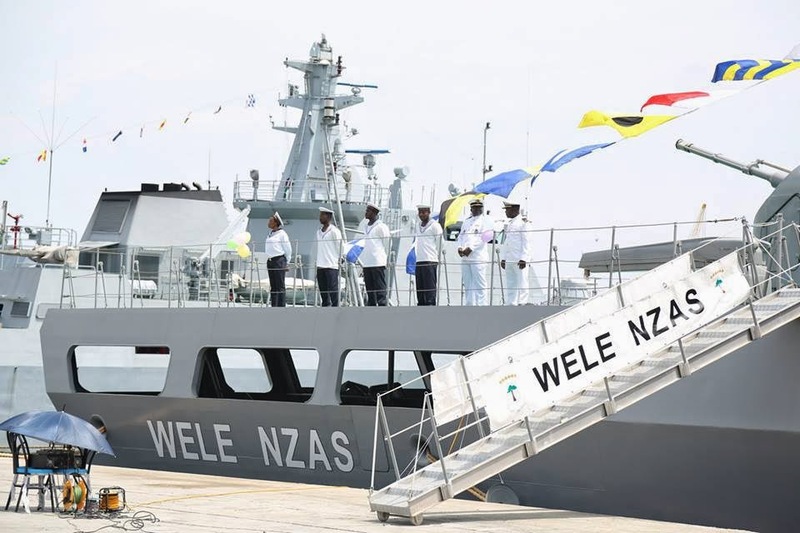 Equatorial Guinea builds its first warship, Wele-Nzas, to strengthen the national naval forces and safeguard the shores of the country. Its inaugural route was from Malabo to the Bay of Luba. 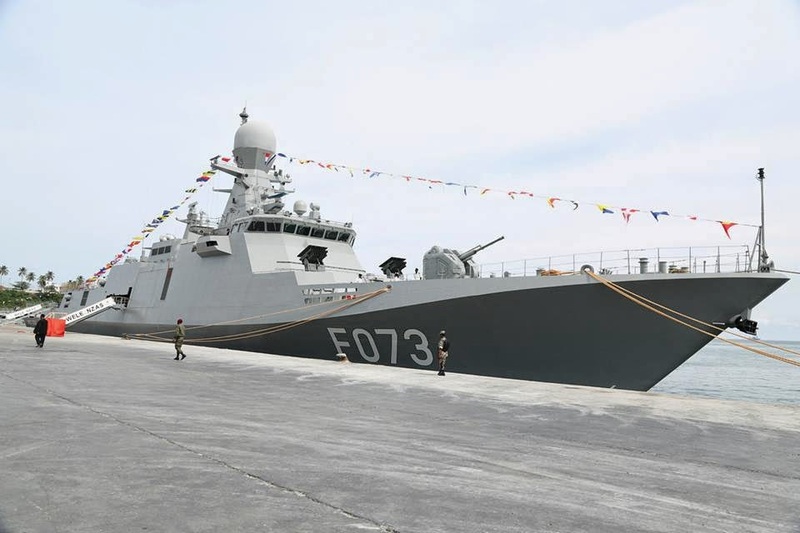 The frigate has four main engines that reach speeds of 25 knots; rocket launchers and anti-rocket defense; an assault patrol boat and an airstrip for helicopters. President Obiang Nguema Mbasogo chaired the unveiling ceremony held at the Port of Malabo. During his welcoming speech, he noted the importance of equipping the Navy with a new warship, given the geographical situation of the nation set on the Gulf of Guinea, where the country has experienced several cases of piracy. The First Lady of the Nation, Constancia Mangue de Obiang joined Vice President, Ignacio Milam Tang, vice President Teodoro Nguema Obiang Mangue, Prime Minister, Vicente Ehate Tomi, presidents of constitutional bodies, and special guests, such as former President of the Federal Republic of Nigeria, Olusegun Obasanjo, and the Prime Minister of the Democratic Republic of East Timor, Kay Rala Xanana Gusmao at the ceremony. President Obiang also inaugurated a new Air Force barracks facility near the capital city. The modern installation consists of 294 apartments with capacity to accommodate officers, non-commissioned officers and soldiers in an area of ​​80,000m², including a soccer field. Equatorial Guinea hosted leaders from the Africa, Caribbean and Pacific Group of States (ACP) to discuss strengthening the community, the future of the ACP in Central Africa (especially after 2020), promotion of trade cooperation, and partnership with European community. The meeting was held on June 2-5, 2014 in the Conference Center of Sipopo in the capital city of Malabo. In his welcoming address, President Obiang Nguema Mbasogo laid out the new challenges facing the ACP, which require ACP leaders to properly position themselves in an international context characterized by constant changes. 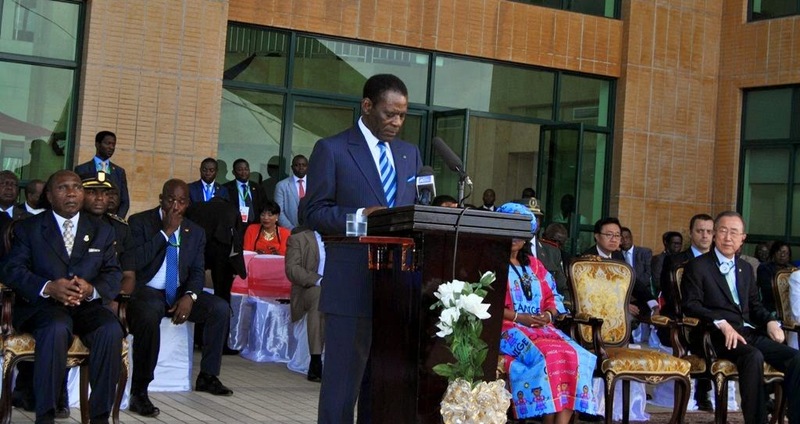 President Obiang said that the member countries of the community must work to provide a vision following 2020, the date on which the Cotonou Agreement regarding the association between ACP countries and the European Community and its member states. The Cotonou Agreement was signed in 2000. “We must continue to strengthen the solidarity between our countries, adopting attitudes of justice and equity in order to attain a better position in the international arena, identifying ways to ensure our cooperation for basic development, in an open dialogue. Equatorial Guinea will continue to work tirelessly for equality of treatment and strengthening of the ACP group, with whom we share a common identity on the international stage,” he said. “The solar microgrid will feature 5-MW solar modules and system integration by MAECI, an energy management system and controls from Princeton Power Systems and energy storage from GE,” MAECI said in a news release. This project will be Africa’s largest self-sufficient solar microgrid and will bring significant benefits to the West African nation. It will supply Annobon Island with reliable, predictable power and will supply enough electricity to handle 100 percent of the island's current energy demand. Chris Massaro, senior vice president of MAECI said that the project would both raise the quality of life and advance the Equatoguinean government’s goal of diversifying the economy. “The Annobon Electrification Project will be the platform for economic growth on the island by bringing a much needed power supply that will enable the development of multiple industries, add 700 to 1,000 direct and indirect jobs to Annobon Island and significantly raise the standard of living,” said Massaro. Annobon Province consists of tiny Annobon Island and has a population of 5,000. The Annobon Province currently has reliable electricity for only a few hours a day, but the solar microgrid aims to provide electricity 24 hours a day, seven days a week.